To be honest, I do not really like flying. It is too high, crowded and makes me feel anxious. But yesterday, I had my first real wonderful and exciting flying experience with the Polar5 team. The goal for these aerial surveys is to obtain high-resolution laser scanning and optical image data that allow us to upscale from our small local installations on the ground to larger areas. 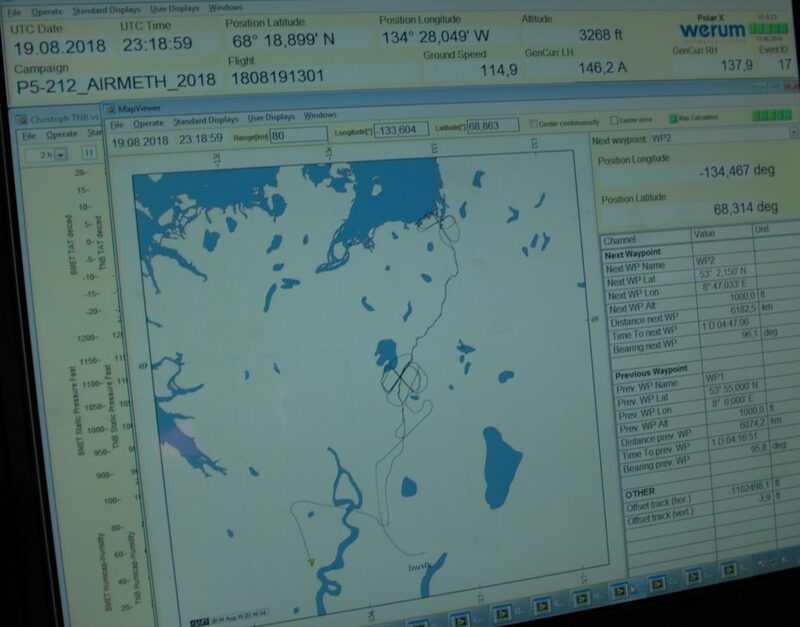 With the aircraft, you can cover about 200 km in one hour, whereas walking on the tussock tundra and taking simultaneous measurements takes hours! Stephan and I were the “newbies” on board of the plane. The very experienced team of pilots Jamie and Kodi and the AWI crew of Jörg Hartmann, Wolfgang Dierking, and Benjamin Harting gave us safety and instrument instructions. The weather was not ideal with low clouds and some rain. 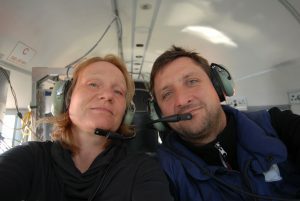 Still, we managed to fly all the way to Tuk in the north, and all the way to the southern part of the Mackenzie Delta. From the airplane we were scanning the surface, measuring atmospheric methane concentration, and taking pictures with the new DLR camera called MACS. MACS is the Modular Aerial Camera System that was installed in the Polar5 this year. It takes aerial images in the visible and near-infrared spectral range. With an altitude of 1km above ground level MACS-Polar images have a ground resolution of 8cm per pixel in the visible and 15cm per pixel in the near-infrared spectral range. At this incredibly high resolution, we will be able to identify individual trees! 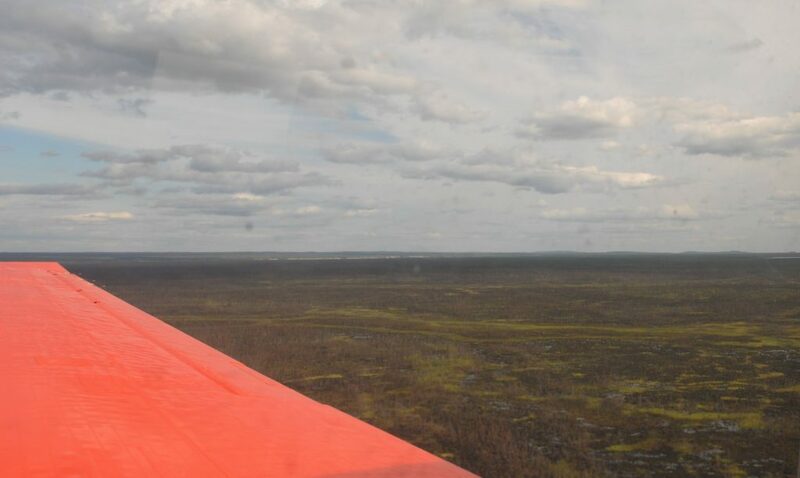 We did have spectacular views of the Mackenzie Delta, a recently burned fire scar in the southern part of the delta, and permafrost features such as pingos at Tuk. Natural fires are common in permafrost areas, but they have a significant effect on the permafrost since they accelerate the rapid degradation of permafrost. 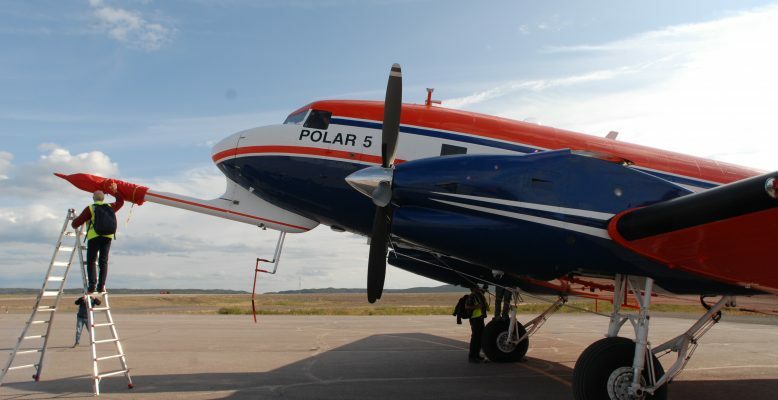 Thanks to the Polar5 team members and the pilots I look forward to our next flights over our study sites. Pingos are circular or oval-shaped ice-cored hills in the Arctic. Pingos have core that consist of a mass of clear ice, which may be only slightly smaller than the pingo itself. They may be up to 90 metres high and more than 800 metres across. Active pingos can grow a few centimetres per year for up to 1000 years. Cracks in the overlying material at the top of the pingo may expose the ice; the ice then starts to melt and may create a smaller crater or lake. 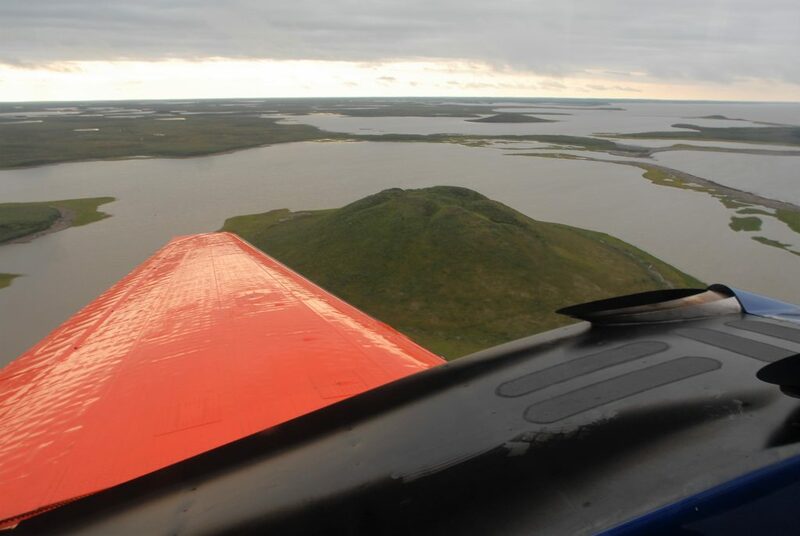 The term “pingo” originated from the Inuvialuktun word for a small hill.